Find your center with the Mighty X. Some drills are geared to beginning players and some are geared more to advanced players. The Mighty X drill is great for players at any level. It is a drill that many pro players do, and a few of them have referred to it as their favorite practice drill. There are three key parts in your pool game: straight cueing; consistency; and being able to hit the cue ball with follow, center and draw. The Mighty X drill addresses all three elements. This drill really helps me. Unwanted English is a common problem for us all and it is something that will hurt your game long term because your muscle memory will adapt to it. That results in bad habits, which are sure to hurt you. Players don�t even realize they are not hitting center cue ball. That�s why it�s so important to practice a drill like this. It forces you to find center cue ball and really helps improve your alignment. As you can see in the diagram, the Mighty X is a relatively simple drill to set up. The balls should be in line diagonally between the corner pockets. 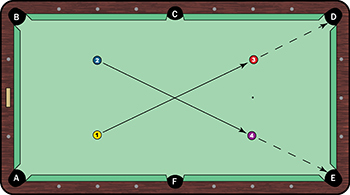 Pocket the balls using the opposite object ball as the cue ball. For instance, start by using the 1 ball to pocket the 3 in pocket D. Use the 2 ball to pocket the 4 ball into pocket E. Replace the balls and use the 3 to pocket the 1 into pocket A and the 4 to pocket the 2 into pocket B. The challenge to this drill is to pocket these shots using enough follow to have the 1 follow the 3 into pocket D, and so on. This shot requires you to strike the cue ball perfectly. It is important to keep your cue level. Any elevation on the cue will increase your chances of having the cue ball (or in this case, 1 ball on the first shot) lose its line after contact with the object ball. Spot the balls again and shoot each shot with stun, stopping the cue ball precisely where it hits the object ball. Finally, repeat the shots using draw. Ideally, you should draw the cue ball back to the opposite corner for a scratch. I don�t stop until I make four shots in a row for each category. If you can make all four shots using follow, stop and draw (12 total shots), you are striking the cue ball at elite player levels. This drill takes patience. It�s difficult to make all of these even if you are an elite player. And don�t get frustrated if you are only making two out of four or three out of four. That would still be considered progress and you still get great feedback when you do happen to put a bad stroke on the ball. This is a great drill for two people. You can rotate shots and the non-shooting player can place the balls for the next shot. It makes the drill fun and you can also add a competitive element to it.